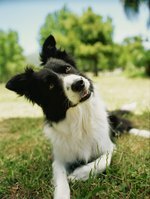 Dogs can hear a greater range of sounds than people can. People hear sounds in the frequency range of 64 to 23,000 hertz while dogs can hear sounds in the frequency range of 67 to 45,000 hertz. According to dog behaviorist Steven Lindsay, frequencies above 36,000 hertz can be painful to dogs, resulting in whining or barking. These sounds are inaudible to people but are used in personal dog deterrents to startle dogs and make them want to get away from the noise. Your dog hears more than you do. Animal hearing can be damaged by prolonged exposure to loud noises just like human hearing. A combination of high frequency and high volume will cause the most pain and discomfort. At high volumes, frequencies above 25,000 hertz are uncomfortable for dogs and will cause the dog to whimper or run away. This is basically how ultrasonic dog repellents work. Use caution with these as they can be painful to your pets.